Color is the most significant factor that affects our mood and perception of any visual element, and making the right choice of a color combination is considered a priority, regardless where it will be used. This roundup is about the online tools that will help you accomplish that, 15 to be exact, packed with features to make the process of generating color palettes, schemes, and themes a smooth, pleasant, and creative experience. ColourLovers has always been a favorite destination for designers, not only because of its vibrant community, but also for the great online tools they provide. I have listed their pattern generator in a previous roundup, and now again, COPASO their advanced color palette tool, is going to be on this list. In case you find COPASO a bit intimidating, you can try their basic color palette tool. 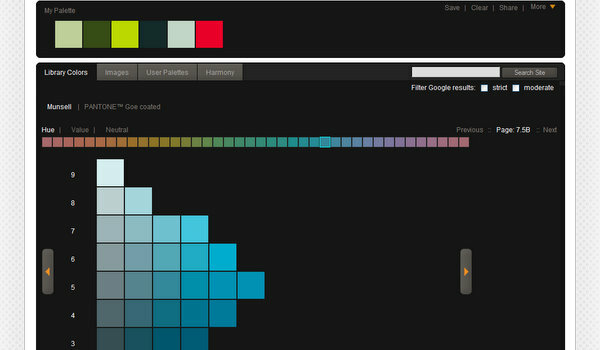 Kuler is Adobe’s online color themes generator, it’s an advanced and yet very simple tool to use. The tool comes packed with features, and you can even download a desktop version. Toucan is a powerful tool with lots of features to help you generate color palettes. Toucan is part of a suite of creation tools by Aviary. 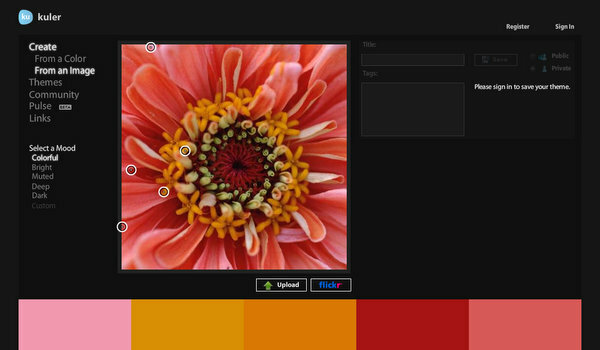 The newest addition to the color palette generators is the revolutionary ColoRotate. 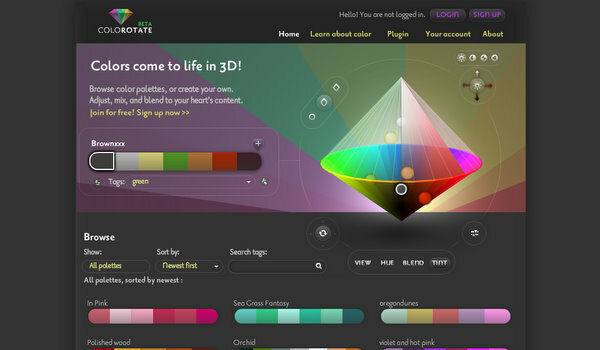 The approach is simple: 3D – just the way our brains perceive color. You can also find very useful information about color in their Learn about color page. 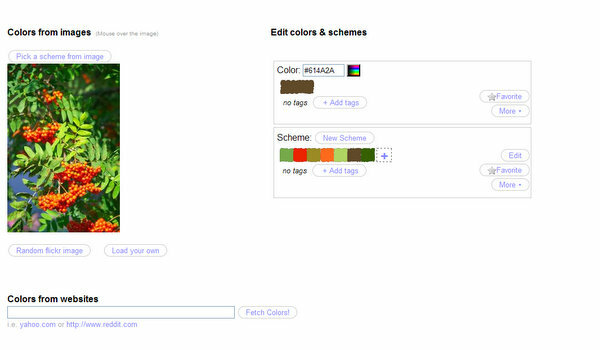 ColorExplorer allows you to generate color palettes from an uploaded image or from selecting colors. 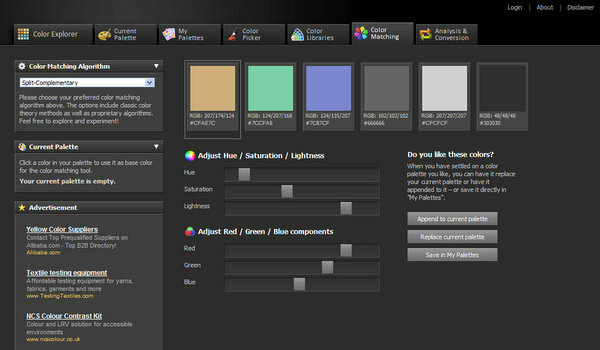 You can also explore the color libraries or use tools such as the color matching tool and the analysis and conversion tools. Colr.org has many features to help you generate a color scheme: You can generate color schemes from color, from image (uploaded, from URL, or a random Flickr image), and from the colors of a website. 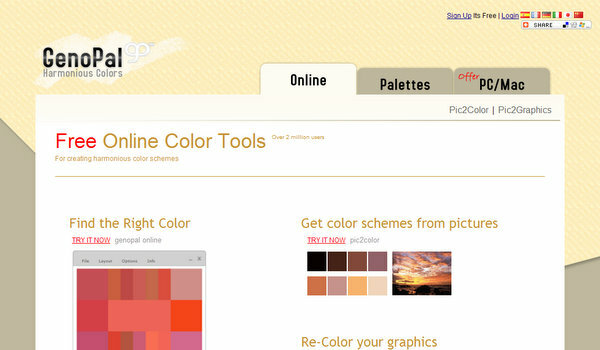 You can also explore the previously created colors and schemes for some inspiration. GenoPal has two online tools to help create color schemes; you can extract the colors from an image, or you can generate your own color scheme. 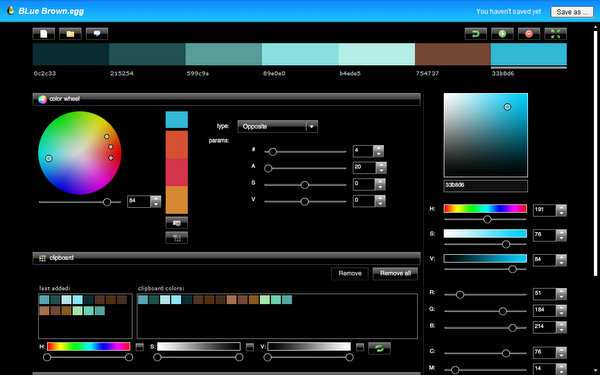 ColorJack is a popular destination to explore and generate color palettes and schemes. 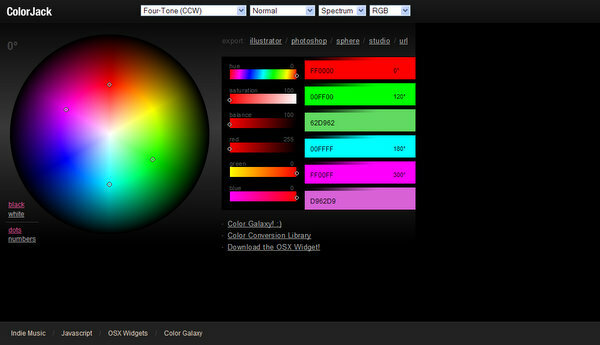 The site has many interesting tools such as the Color Sphere, Color Studio, and Color Galaxy tools. There is even a Color Blindness chart and other goodies that you can learn about from the blog. 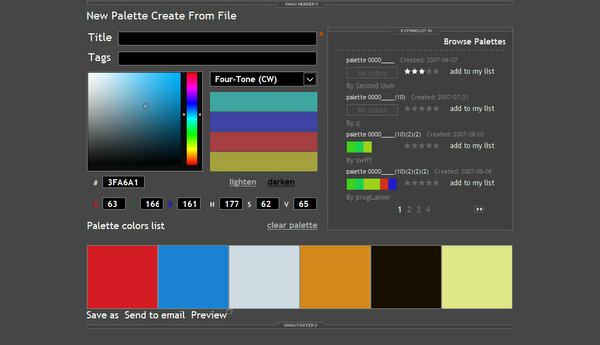 W3-Palette is a simple and straight forward destination for creating and exploring color palettes. 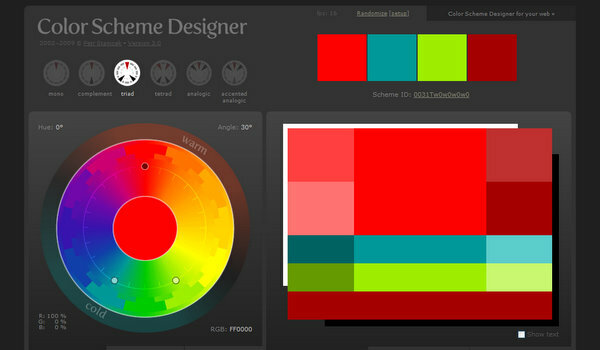 Color Scheme Designer is considered a favorite among web designers. The tool has been around for a while and has evolved at the hands of its creator, Petr Stanicek, to version 3. The Colors Palette Generator by CSSdrive is a useful tool to easily create a color palette from an image. Images used to create a color palette can either be uploaded from your own machine, or from any URL. 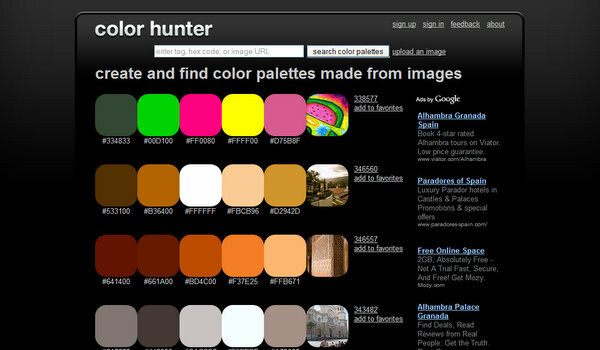 Color Hunter is a site that allows the exploration and generation of color palettes from images. 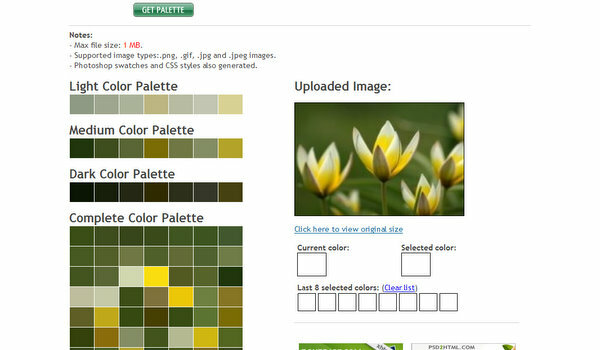 The images used in the process of generating a color palette are found by searching Flickr for images tagged with your search term. 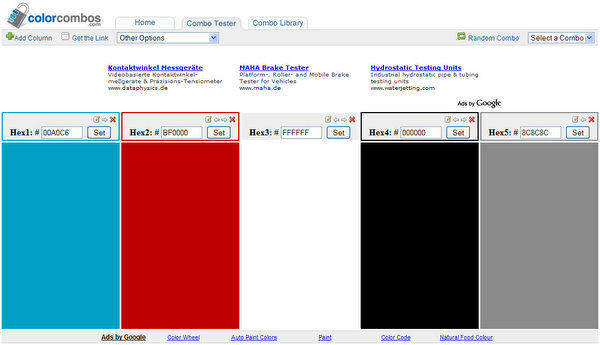 Combo Tester displays your selected colors in columns making it easy to view the color combination. 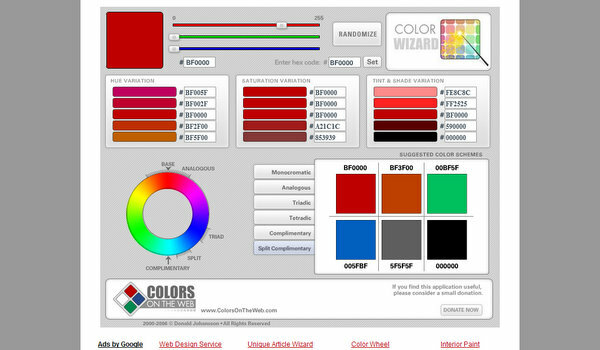 The site also offers the option to grab the colors from a website, along with exploring the combo library. Color Wizard has a clear and simple to use interface that allows a quick experimentation with a base color. Excellent collection. Good job ! This is not a web based app but I like color schemer. Thanks for including ColoRotate in this great list! Our key innovation is that the picker is 3D. 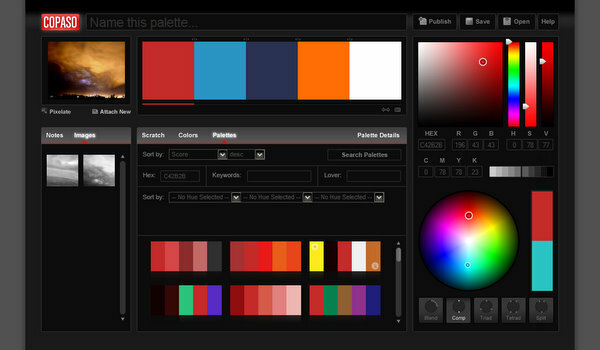 Based on feedback, we have a few small improvements coming soon, including a full-screen view of your palettes. Very nice bit. This was just the sort of thing Telletto needs for a couple of web projects including one related to alien abductions. Is there any of these that match pantone coated colors with closest RGB or Uncoated for that matter. I know Colormunki does pantone geo. But It would be cool to find a fully flexiable color generator that take that stuff in account. I know monitor varry… but if you new that one color you used on a bc could be match across all mediums…. Interesting feature if it’s available. Until this is answered you may wanna check the Color Conversion Tool by ColorExplorer.com. I actually had this feature on ColorExplorer until PANTONE approached me asking for it to be removed. They find that the use of PANTONE colors names violates their trademarks. Yes its true that the color is the most significant factor that affects our mood and perception of any visual element. I think 15 Hand Picked Color Palette and Color Scheme Generators are very helpful for the visitor to aware of it.This post is great resource for the readers. Keep it up. LOVE IT!!! Has the grab-colors-from-photo, mix-these-two-colors-together, make-this-color-ligher, keep-track-of-my-favorite-colors, and save-palette-for-Photoshop functionality that I couldn’t live without! This is ella and I just color …. http://www.colourlovers.com/ bad bad boy ! http://colorpilgrim.com is missing from this list. I guess because it is fairly new. I personally like it because it has ready color combinations classified by mood, trend and category. So if I have to justify a color scheme to a client, I can back it up. Check it out – its pretty awesome. Great article. Thank you for putting together so many sites in one location. This will be a big help. This will help even the most uninspired to choose what colors to use. I’ll have to check them individually.